So, what are microgreens? Microgreens are the two-leaf sprouts of larger plants that are super healthy and easily grown at home. Originally used as beautiful garnishes in fine dining restaurants, microgreens now are commonly used as a super charged lettuce alternative. 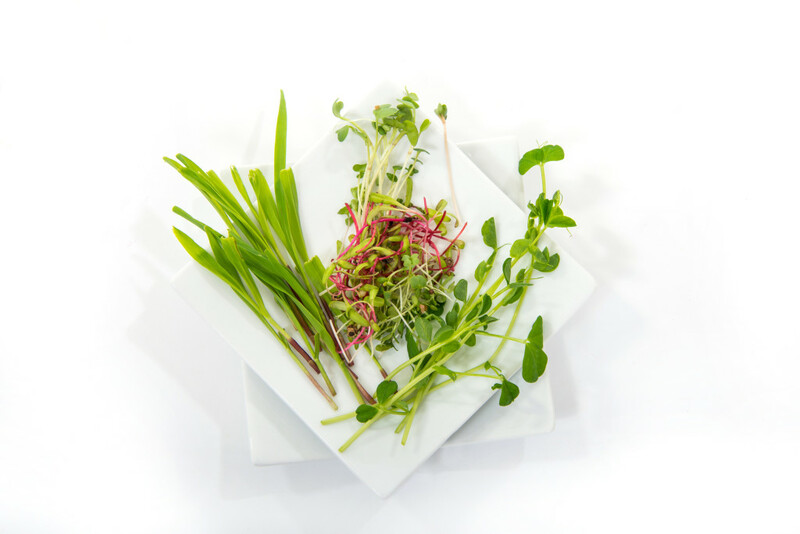 Packed full of vitamin E, K and C, microgreens pack a nutritional punch. Once Harper’s Bazaar featured microgreens in the Superfood edition of THE LIST microgreens appeared to be featured on food blogs everywhere. As a trending superfood, microgreens seemed all the rage—perhaps even the new kale. 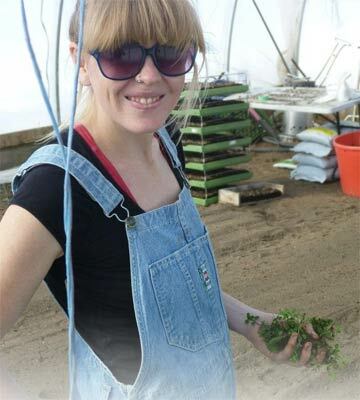 Jenny Spring a young 26-year-old entrepreneur/owner and operator of The Spring Farm makes a living from growing/selling microgreens and other varieties of produce to local families and chefs in Huntsville, Ontario, Canada. I had never heard of these itty-bitty nutritional powerhouses before meeting Jenny. I was curious to learn more about the plants and girl behind this one-woman gardening start-up so; I decided to pay her a visit. As I pulled into Jenny’s driveway sitting neatly on the wooden wrap around porch a humble wooden-etched sign read, “The Spring Farm.” Jenny welcomed me, opening her wooden screen door directing me towards her microgreens. Growing indoors on old bookshelves the most delicious and fresh little plants you’ve ever seen. Selling at $25 per bed (about 1ft x 2ft) in dimension these little plants were getting Jenny through the winter. 100% of Jenny’s winter business consists of cultivating these mini-culinary wonders. With the ability to grow microgreens indoors and outdoors microgreens can be profitable in a ‘non-growing’ season for home gardeners. “It’s a niche market”, she says. Growing ten different types of microgreens Jenny already has a large clientele of local chefs and families. “Try this one,” Jenny says picking a small two-leaf microgreen with a red stem. Packed full of flavor the radish is spicy and fresh. Jenny explains that each green has a distinctly different flavor. As I tasted, Jenny explains how most people can grow microgreens at home both for personal consumption and even paying customers. As a farmer, Jenny knows the importance of sourcing fresh local ingredients. Growing your own microgreens and learning where your groceries come from is an essential step to demystifying and dismantling destructive agribusiness. Our conversation shed light on the how the grow-local gardening movement and how consumer trends are shifting. 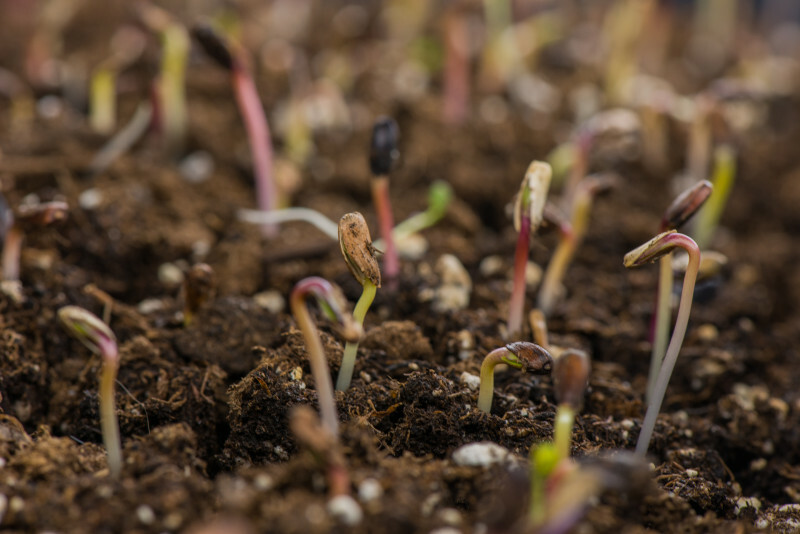 Microgreens are the first leaves grown from seed. It takes approximately 7-10 days until [the microgreens] are ready to sell. When did you discover microgreens? I heard about this guy [Curtis Stone] who runs Green City Acers in Kelowna, British Columbia, Canada. Curtis was doing the same type of urban farming as me, called Spin Farming and making $60, 000 off farming in a season. Once I had heard about him I wanted to farm. I didn’t–and still don’t want to farm and be poor. I finally found a way to make money farming which was desirable. I went and saw Curtis speak a bunch of times and appropriated his model. One reason he makes a lot of money is he grows microgreens year round so it’s a cash flow. When it’s snowing outside and his tomatoes are dying he’s still got the cash flow of the microgreens. What types of microgreens do you grow/sell? I grow two types of radishes, red Russian kale, brown mustard, pea shoots, amaranth, clover, corn, and brassica blend. How many chefs do you sell to in Huntsville? A ton! Right now I cannot keep up with the demand. I am in over my head and need some extra helping hands. All chefs want microgreens and local means fresher. When and why did you start gardening? My roots for gardening are really connected back to my grandmother, the gardener. She always inspired me. I started experimenting with gardening when I was unhappy with an office job I had when I finished University. I hated working inside all day and I didn’t feel like I was contributing to our community. So it inspired me to search for something that felt more meaningful. During university I went out West to tree plant and I just loved it. I was outside all day doing physically demanding work and at the end of the day I always felt rejuvenated and healthy. This feeling I wanted to bring to career. Growing organic produce for my community is very rewarding and it brings such satisfaction to my life everyday. Learning the skills- I did a lot of travelling and when I was travelling I didn’t have a lot of money so I would stay on farms and just work for them in exchange. I decided I wanted to do it by myself so I spent some time working on a farm in British Columbia, Canada. Dairy cows, pigs and huge vegetable garden. But I would have to say a huge part of my education is just reading, there is so much online now. I would really encourage someone; you don’t even need a lot of gardening experience, books and Internet has a lot of resources, I’m on a tone of forums and books. What does you business look like today? I can’t keep up with the demand. I’m selling to families who want greens weekly through a CSA (Community Supported Agriculture) Program. I drop off microgreens with a whole bunch of varieties on Fridays in town the families who signed up for weekly deliveries pick them up from a coffee shop. When Jenny is not farming microgreens she is selling fresh vegetables. Are you excited for the Muskoka North Food Coop to open? Once the Coop opens I can drop everything off at the coop [for my clients]. They will just buy everything from me. I won’t have to do any promotion. Do you have any advice for people looking to start a business or community project growing microgreens? Just go for it. Don’t think about it too much! Microgreens are pretty easy [to grow] and they’re a bit of a cash grab. You can sell them for quite a bit of money and you can sell them all year round. You don’t need a lot of space. Microgreens are pretty easy and they’re a bit of a cash grab. You can sell them for quite a bit of money and you can sell them all year round. Start with a couple of varieties. I learned a lot from YouTube. Find someone to mentor you. What do you think about the urban farming movement? Urban farming is probably not the solution to sustainable agriculture but it’s a good start for people who don’t have any land. Urban agriculture is also awesome because it connects people in the city to farmers who are growing the food. Everyone sees me gardening in people’s yards. People see where the food is growing so now they want to grow their own. The city is where people live and eat and it is where restaurants are. Farming in the city eliminates the distance food travels making it fresher and saves fossils fuels at the same time. How do you think people should be shopping for food? I think you should find a local farmer and buy from them. Someone you trust. That’s what the CAS Program is all about. You’re working around the farmer. Fridays are good for me and I drop them off and I drop them off at a business and they work around that. They know I need to be out in the field doing this or that and also, if I don’t have something one week they’re ok about that. A lot of CSA’s you pay at the beginning of the season, but that agreement if there’s a hail storm that week and you don’t get produce you’re investing in that local farmer. Where do you buy your food? I just bought a full pig from a local farmer. I like to find a local farmer and stock up. I think more people should learn about this. That’s what I want to do with my business provide workshops on this kind of thing. Last year I did a ton of canning. You can eat local and also preserve it. I still have wild strawberries in my freezer. Buying a whole animal is cheaper in the end. I bought a pig and it will probably last more than a year. What do you think about the way our generation thinks about food, is it changing? Ya, big time. More and more people are interested in growing their own food. Like Toronto it’s huge with urban farms. A lot more people are getting sick and they want to eat more healthy food. All my customers are parents’ friends and age; it’s not just young people. It’s not just our generation. The times are changing. There is more research being done on food. More and more people are interested in eating local, non-GMO, organic food. Things are changing so much; my grandmother told me she use to have to hide growing food from her neighbours because it was seen as “lower class”. I am so glad we are moving away from this idea. Would you consider yourself and environmentalist? Yes. I also thrive to have an environmentally conscience business. I travel from plot to plot on my bike and trailer made for me from the local bike shop. I try to re use resources in town so I pick up food scraps on my bike from local restaurants to turn into compost. I have to be green I want to walk the walk and talk the talk. It’s promotion to see me biking through town with a thing of straw on my trailer. You are connecting yourself to the farmer. People see me biking through town and say, “Oh, she’s going to grow food like two kilometres away.” That’s pretty cool. You can go and see that food being grown. You can see the kale and spinach being grown on the main street of Huntsville. You are not going to find these little beauties at No Frills! On a student budget growing your own microgreens can save you a ton of cash and keep you fuelled with vitamins and minerals from fresh greens. The main advice Jenny has is “Just go for it. Don’t think about it too much” and grow your own. Bottom line, get out there and try it. 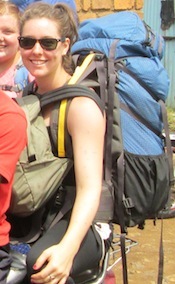 Jenny, and many others like her immersed in the buy local revolution that has captured the 20 something demographic. All you need is some dirt, seeds, your hands and a bit of time and love. There really is nothing like going from seed to plate. Microgreens will get you there quickly and give you quick satisfaction for your hard work. Interested in buying from produce or microgreens from Jenny Spring? Not from Huntsville and surrounding area, no problem click here to contact Jenny and inquire about how you too can get locally grown produce from The Spring Farm. Are you from the Muskoka and surrounding area? Click here. Microgreen photo credit goes to Jenny Kirkpatrick. To find more about her work click here. Previous Previous post: How to be Green…Or maybe not?